I'm not much of a gamer. Today's video games are far too complicated for this old man, with the 84 button controllers featuring motion sensors and gyroscopes and vibrators. My gaming skills pretty much peaked around the Pac-Man and Space Invaders days. So I'm not at all excited by Friday's release of the Playstation 3. That's why when I went to Best Buy on Thursday night to get a memory card for my phone, I was surprised to see about 50 people lined up outside the store, waiting until 12:01am to perhaps buy a new Playstation. Check out the picture I took on the right. They had tents, sleeping bags, folding chairs, laptop computers, and a complete lack of a sense of priority. From what I can tell, this was a pretty tame crowd. Around the rest of the country, we had armed robbers stealing 5 PS3s from an Ohio EB Games store, a riot breaking out at a Circuit City, police having to use pepper balls to control a crowd in Virginia, and many more. Then we have some dorks that were taking donations from people on the Internet to buy a PS3 and then smash it in front of a bunch of fanboys. They collected the money, waited in line for 18 hours like everyone else, and when they got the thing outside they took a sledgehammer to the thing and smashed it to pieces, much to the horror of the true gamers. And they caught it all on film. My favorite PS3 story though is about some company who convinced a card-carrying line-waiting PS3 fanboy to swear off Sony forever. In exchange for a $7500 computer, the guy had to sign a legally binding contract to not purchase or ever own a PS3. The sacrifice must have been overwhelming. I game, I enjoy it...but I am not a nut. I did however, capture an image of some nuts in my very own front yard. They started camping Monday, got thrown off of three different places and wound up down the street at my house at about 9 or 10 at night. No one actually asked us (my neighbor has since said they asked her, but we didn't know it at the time). I thought it was so funny, and a little pathetic...I didn't have the heart to kick them out. 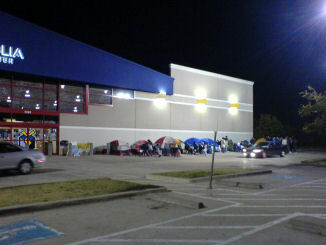 Rumor has it, it didn't matter that they had camped for days, either, as the store raffled off the Playstation 3s it got anyway.